Having the handy dandy resource of ‘Links to Retailers in Canada‘ over there on the right side of the page, I took a tour of the interweb to see what stores are advertising a special Free Comic Book Day event. Yes, I clicked every store link. Note to Retailers: if you would like to have your special event listed, send us an email retailers@joeshusterawards.com. The inclusion of the listing will be at the editor’s discretion. Local radio station 97.5 the River on location for the morning, and will be handing out random door prizes and a grand prize raffle. Door prizes between 9:30 AM – 5:00 PM. Costumed guest artists will visit throughout the day. All the HH family of stores will be hosting roller girls, wrestlers and local artists. Comic Readers note: As of April 28th CR Downtown will be moving to 2125 11th Ave, Regina. Both Saskatchewan locations of CR will be hosting Chad Boudreau to sign his new book, Acts of Violence. He’ll be at the south store from 10am – 1pm, and the downtown store from 2pm – 5pm. 128 pages. Free balloons for the kids! Raffle tickets will be given with purchase for a chance at some amazing prizes. Participate in Brampton’s Best Undiscovered Comic Artist – in partnership with Visual Arts Brampton. Best Costume Contest – come dressed up for a chance at winning a prize. Silent Auction – Place your bid on amazing items, with proceeds going to support the Hero Initiative! The Comics for Kids Award sponsor will host two fantastic guests who create all-ages comics. Also being given away are preview copies of the Allison Dare preview booklet, getting you ready for the Allison Dare relaunch from Tundra Books. Exclusive to the Dragon. Ronn Sutton and Janet Hetherington will be at the store between 12:00 noon until 5:00pm for signings. Vince Deporter will be sketching and signing from 10-4. London, Ontario – most of the local stores will be participating in their annual passport event. These stores are: L.A. Mood, Heroes, Comic Book Collector, NeoTokyo & World’s Away. What do they do? Pick up a passport at one of the above stores. 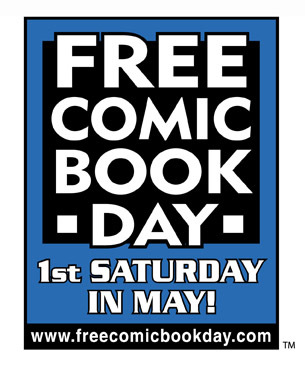 Visit each of the participating stores on FCBD, get your ballot stamped and drop it off to win one of over 25 prizes! FM96 broadcasting live between 11-1. Listen to FM96 during the next week for special L.A. Mood giveaways. The Durham Comics Guild will be on hand. Choose 3 comics each from over 25 different choices. Great comics for all ages, young kids to adult focused. Bring your family and friends! This entry was posted in General Announcements, Happenings, Retailers by Robert Haines. Bookmark the permalink. Thought you might be interested in the fact that Mariko Tamaki will be at the Festival of Words in Moose Jaw July 15-18, 2010. She wrote the graphic novel “Skim” and the drawings were created by her cousin Jillian Tamaki. She will be discussing the collaborative process and will also be doing a powerpoint presentation. Check out our website http://www.festivalofwords.com for more information on Mariko Tamaki and the other authors participating in the festival this year.